The capital of the Roman province of Asia Minor was a magnificent city. Its buildings showed the greatness of the empire and its thriving culture materialized in the second library of the ancient world, after Alexandria. The city was the main producer of parchment and ended up giving this name to write support widely used in antiquity. Nowadays, Bergama Acropolis includes the populous from the top of the hill that rises in the center of town. History tells us that Pergamum was fighting city and later Persian. After the conquest by Alexander the Great and the death of the Macedonian king, the governor of the city, called Lysimachus, founded a dynasty that lasted 170 years and managed to seize the wealth of the city to keep amid disputes faced the former generals of Alexander independent. The kings of Pergamum were allies of Rome and the last one, Atalo III, He left the city in the Empire heritage. Pergamon Rome made the capital of his province of Asia Minor. In the Book of Revelation, Pergamon appears between seven churches mentioned. Current Bergama is a 100 kilometers north of Izmir, near the bay opposite the island of Lesbos. When it comes to town, Immediately you can see the Acropolis on the hill. Until October 2010 climbed by car or bus but now we have a nice cable car to avoid driving on the narrow road that climbs to the ruins. Leaving the gondola find some souvenir shops and crafts near the entrance to the Acropolis. The walk through the ruins is nice because the views of the valley of Pergamum give this place an added attraction. The first thing you see are the remains of the Agora, al style built Priene. Then we will see the place where the altar of Zeus was, Currently displayed in Berlin as a gift from Sultan Abdul Hamid II. Bergama City Council and the Turkish government have demanded the return of the Temple, one of the most important works of Greek art. In its friezes is represented the combat of the Titans against the gods. Then we will see the remains of the library, the second largest in the ancient world. Although the parchment was used long before, were the inhabitants of Pergamum who perfected their design and managed to end up displacing papyrus for making book. The papyrus was much more uncomfortable for both writing and also to manage the plant which produces only grows on the banks of the Nile. On the contrary, Parchment is made from animal skins and he can also known books or scrolls of antiquity. 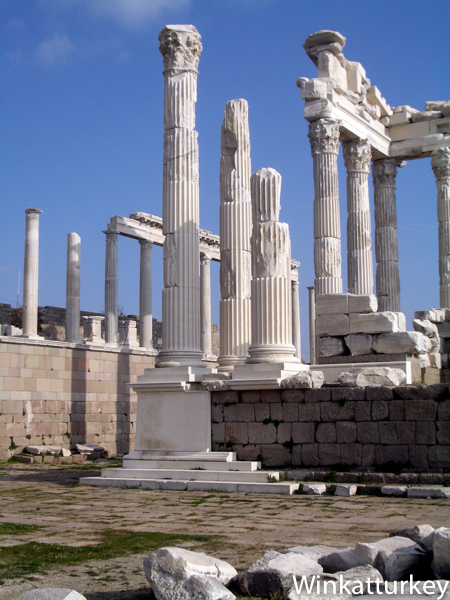 The library of Pergamum was sacked by Marco Antonio to give away all their books and bring Cleopatra to Alexandria. The visit ends with the spectacular theater. Is the world's steepest and accommodates 10.000 spectators. Sitting in their seats we can see the valley and the city of Bergama below us and imagine as representations should be in that place for more than 2000 years ago. This is one of the most recommended visits to archaeological sites, also, in Pergamum also have the Asclepeion Galen and the Red Basilica.